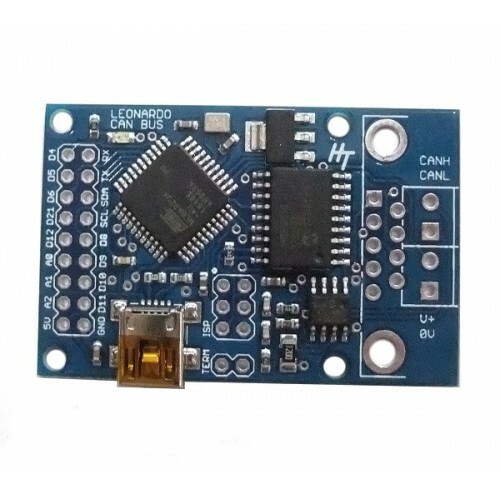 This Arduino Leonardo based CAN-BUS controller board contains an ATmega32U4 microcontroller with the Arduino Leonardo bootloader installed and uses the Microchip MCP2515 CAN controller with MCP2551 CAN transceiver. 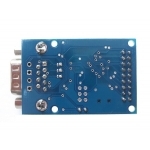 CAN connection is via a standard 9-way male d-sub socket for use with an OBDII cable or via a 4-way terminal connection. 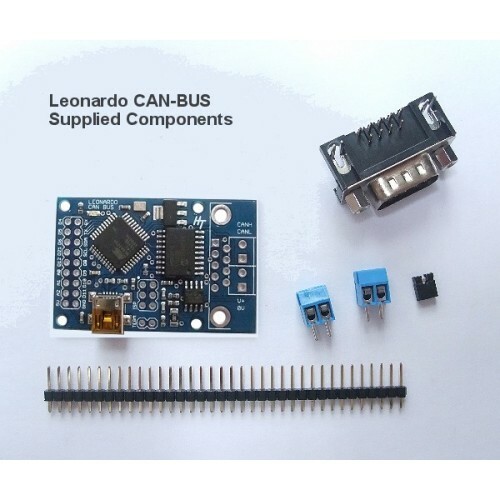 The Leonardo CAN-BUS board is supplied fully tested but with the header pins, 9-pin d-sub socket and terminal connectors unsoldered. 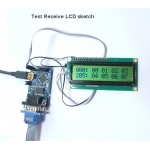 USB-CAN firmware for Linux gs_usb This is the gs_usb_leonardo project that adds native Linux SocketCAN capability. According to the Can-Bus specification, a 120ohm terminating resistor should be placed across the CANH and CANL lines at each end of the Can-Bus. This resistor is built onto the board and can be connected using the jumper link to connect the two pins labelled TERM. This should not be required when connecting to a vehicle OBDII system. 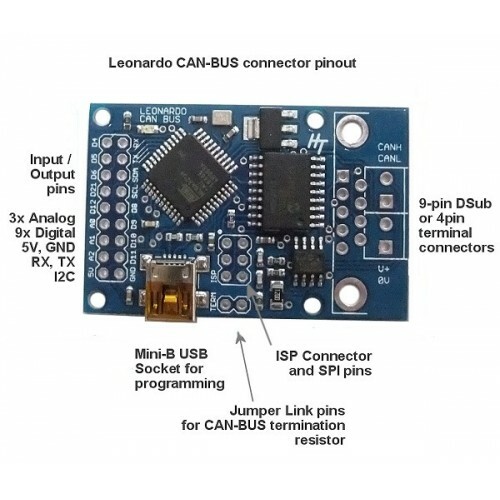 First download and install the Arduino CAN-BUS library. 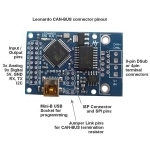 The example programs from this library are designed for the Sparkfun Arduino Can-Bus shield which has slightly different pin connections, so the example programs won't work without modification. 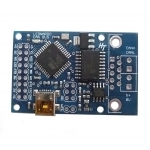 The MCP2515 CAN BUS chip uses SPI for communication with the microcontroller and the Chip Select pin needs to be set correctly. In the example programs, the chip select pin needs to be changed to 17. I.e. 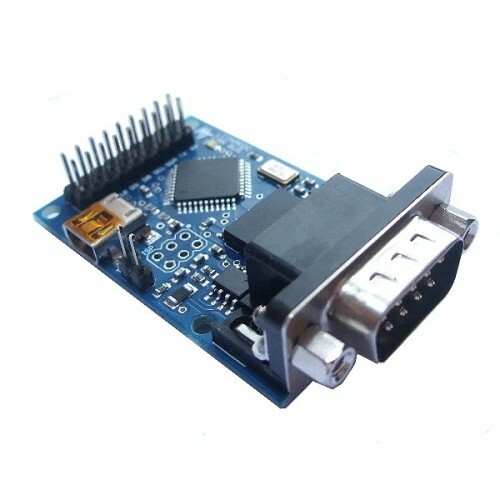 If you reprogram the bootloader onto this board or use a programming language other than Arduino, you must set the L Fuse to 0xBF. This activates the CLK OUT pin which is used by the MCP2525 chip. Without this fuse setting, the Can Bus chips on the board will not work. 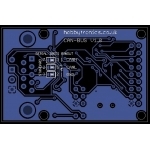 There are a couple of different wiring schemes for OBDII cables. We have 3 solder jumpers on the rear of the board which will allow you to set the Serial DB9 connector to one of 2 cable wiring schemes. 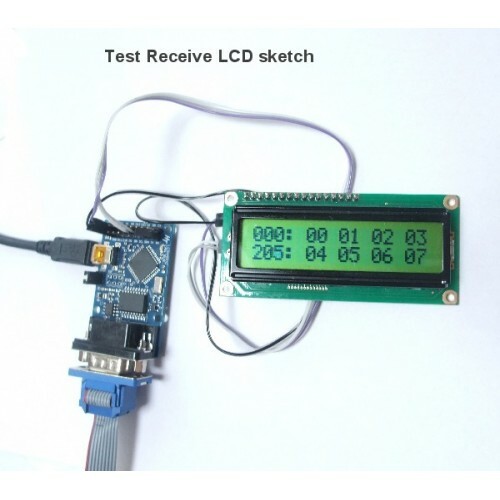 The OBDII cables we sell from Sparkfun use the alternate wiring scheme, and so this is how the boards are setup.To change to the Standard scheme, unsolder the links and solder the center tab to the left tab (see diagram below). Unfortunately, when we had the boards made, the silkscreen printing on the rear of the board was missed, and this is what it should look like.